My counselor says that I’m making progress. I think this is a good thing, but my counselor also fought in Vietnam and worked in prisons so he’s seen a lot of crap. Ironically, I didn’t know that I needed counseling until I was knee-deep in parenting. Caring for a toddler and a preschooler while working part-time shot my blood pressure up 30 points and kept it there for over a year. My coping mechanisms—honed for thirty years as a perfectionistic introvert—proved…how can I say this nicely?…inadequate. No longer could I escape into a book or find some lovely mountain retreat. There was no time to read and no solitude to soothe. 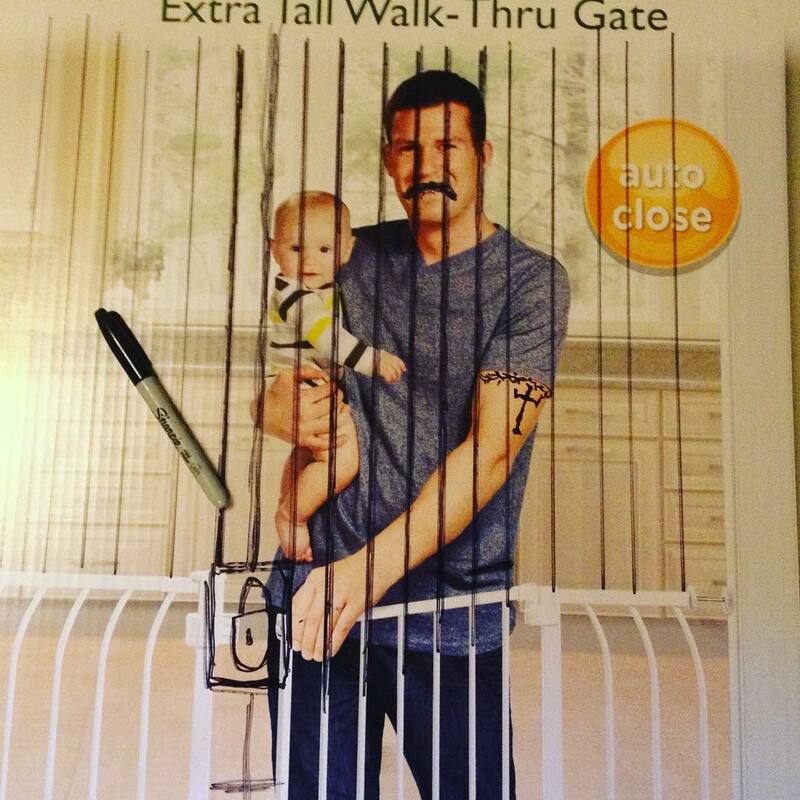 I took a Sharpie and drew black prison bars over the slim smiling man on the front of the baby gate box. Take that, I thought bitterly, you well-paid childless model. Then I put up the gate to keep my children out. Most friends thought that I was fine. My Facebook and Instagram accounts gleamed with tastefully curated pictures of happy children and well-prepared food. I accepted “likes” as currency, a sort of emotional payment to myself that told me I was doing well, that everything would turn out all right. But neither of those accounts showed the times that I blew up at my boys or yelled at my wife. And they didn’t show the spiral growing tighter, the episodes more frequent. When I looked at myself in the mirror I hated the nasty stranger who stared back. I felt like I was drowning. Counseling helped. It put pressure on the bleeding and gave me some tools I hadn’t before known. My counselor also said that if nothing else changed but me, that would be enough. “We can’t control people, circumstances, institutions, or outcomes,” he said in his gravelly voice, “only ourselves.” He was telling me, in a nice sort of way, that the biggest problem I have in life is myself. Jerk, I thought. But he was right. A lot of parenting advice comes from medical experts who talk as if they have never changed a blow-out or lost a night of sleep to tend sick children. Or if they did, they dealt with it so gracefully as to be utterly unhelpful to normal people like me. Listen, this crap is real. And it needs to be talked about in the present tense in a way that everyday parents caught in the blow-out trenches and backyard tantrums can relate to. High expectations, low serenity; low expectations, high serenity. As a person thinks in their heart, so are they. My life is composed largely of conflict between my unrealistic expectations and the cold hard crash of small children rolling strollers through my field of idealistic flowers. If I expect my two-year-old to eat with fork and spoon and leave the table cleaner than when he arrived, I set up myself—and him—for failure. Set my expectations low and find joy when they are exceeded. Self-talk turns into parent-speak. Everyone has their mind constantly tuned to a talk-radio station with their own voice as narrator. This is the voice that narrates your life and it is the voice that eventually instructs your children. It has the power to encourage them or to crush them. Is your station mostly positive and realistic, or is it dark and cynical? Your kids can’t change your station; only you can. Resentment covers over a multitude of love. The person you won’t forgive is the person who most influences your parenting. Is it a family member who abused you? A father figure who never found the time to say he loved you? A friend who betrayed you? A priest? A spouse? Resentment and bitterness are the greatest sources of our anger. They keep us locked in a prison of our own making and they act like poison in our current relationships. None of us would let our child climb into a curtained van with a stranger, but many of us bring these hurtful strangers into our children’s lives on a regular basis through our own unresolved bitterness and anger. Learn to forgive. Comparison kills contentment. It’s been said before, but when I compare my life to someone else’s social media accounts I compare my boring documentary to their highlight reel. None of us is as important as we think, and none of us is as uninteresting as we fear. The competition of parenting—if you can call it that—is less like the Olympics and more like the Special Olympics. Let’s cheer each other on with genuine joy and without comparison. We’ve all come a long way and been through a lot. Practice gratitude. Progress, not perfection. When we left the hospital with our first child, I remember standing in the parking lot looking around in bewilderment for the real parents. You know, the actual parents. The responsible ones. The experienced ones. It came as a frightening shock to realize that THEY were US and WE weren’t THEM. Parenting is always riding the edge of uncertainty and inexperience because we are learning to be parents just as our children are learning to be whatever age they currently are. It is a recipe that demands humility, a healthy sense of humor, and lots of help. Any young parent who thinks they have their crap together is just living on Planet Instagram. On some days, progress means that everyone is still breathing. Check. Screens are sugar. In the short-term they make kids happy. In the long-term they make them insane. Lots of screen time has been proven to make children restless, depressed, and socially disconnected. Set limits and stick to them. It doesn’t matter what other parents allow: all societal indicators say too much screen time is killing our kids. Swim against the tide on this one. Good parenting is not always safe parenting. It is more important to be a good parent than a safe parent. Children often learn best through pain. We can’t and shouldn’t protect our children from every scratch, every fall, every hurtful friend or tasteless vegetable. Consider the way God parents. Has he allowed suffering in your life? Yes. Does he try to control you to do what he wants or force you to make all the right choices all of the time? Absolutely not. ”’Course he isn’t safe,’” Mr. Beaver said about the great Lion Aslan in The Lion, the Witch, and the Wardrobe. “‘But he’s good.’” Good parenting is greater than safe parenting. Self care is child care. When I feel tired, hungry, irritable, angry, or out of shape, I am more susceptible to stress and more easily thrown off-balance by the normal wear and tear of small children. In many ways, taking care of my own physical, mental, emotional, and spiritual needs is just as important as caring for my children. Time invested in activities or habits that bring you joy, health, and satisfaction is time invested in the well-being of your children. Any guilt you feel about normal matters of self-care is false-guilt. Get rid of it. Rehearsing these eight phrases has improved my parenting because it has arrested my own slide into depression and stress. A healthier mindset—more realistic, more graceful, more grateful, and more humble—results in a healthier parent and by extension, healthier children. If that’s progress, then I don’t need perfection.